Only one show made it to a 1.0 rating. FOX: The 2-hour season finale of HELL’S KITCHEN dropped 0.1 from last week’s hour to 0.8. CBS: BIG BROTHER: CELEBRITY EDITION topped the night with a 2-hour episode at 1.0. BLUE BLOODS lost 0.1 to 0.7. 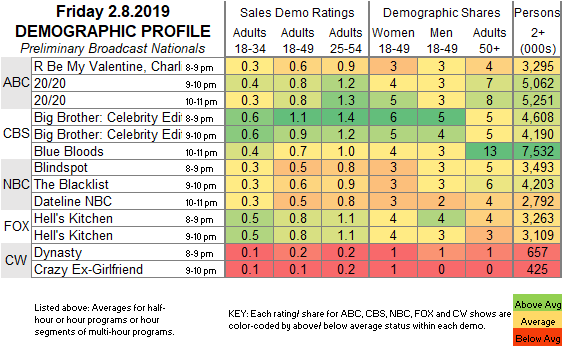 ABC: The year’s run of BE MY VALENTINE, CHARLIE BROWN was steady with last year’s 0.6 (although that one faced the Opening Ceremony of the Winter Olympics). A 2-hour 20/20 gained 0.1 to 0.8. NBC: THE BLACKLIST rose 0.1 to 0.6, while BLINDSPOT and DATELINE held at 0.5/0.5. CW: DYNASTY (0.2) and CRAZY EX-GIRLFRIEND (0.1) were steady. Tonight, Halsey is both host and musical guest on SNL. On Sunday, CBS airs the GRAMMY AWARDS, and AMC’s THE WALKING DEAD returns for the back half of its season.